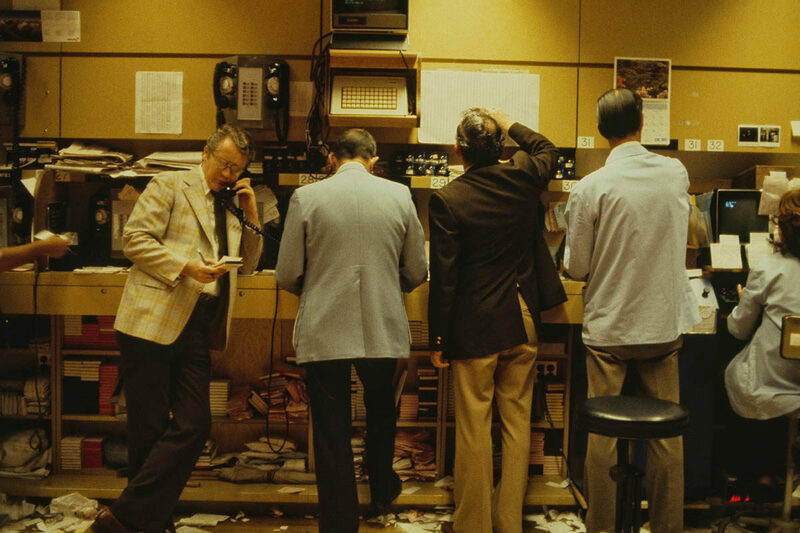 Traders on the floor at the New York Stock Exchange, New York City, USA, 2nd June 1981 (Photo courtesy of Getty Images). With the recent announcement that the world’s most influential investment bank Goldman Sachs is officially relaxing its dress code, bankers around the world have been sent into a spin, forced to re-evaluate their daily work wardrobes. The “firmwide flexible dresscode”, as detailed in an internal memo circulated by the company’s CEO David Solomon (who just so happens to moonlight as a DJ), COO John Waldron and CFO Stephen Scherr, calls for dressing “in a manner that is consistent with your clients’ expectations” to enter into line with “the changing nature of workplaces generally in favour of a more casual environment.” Predictably, the news has been met with a fair amount of backlash from menswear traditionalists: many are heralding this change as the nail in the coffin for what they see as the inevitable death of the suit, mourning decades of institutional convention and the ‘rules’ of corporate culture in the wake of a new age of chinos, sneakers and fleece vests. There is a lot to be said for the formality of business suiting and the message it transmits to the world. A suit conveys control and capability: it’s a sartorial stamp of professionalism, not to mention a safety blanket for stressed-out, number-crunching bankers who seek the ease and comfort in having a uniform, in waking up and knowing exactly what they’ll reach for each day. With the removal of this framework and the entry into a more flexible era of ‘business casual’, a new series of challenges are being thrust upon those set staunchly in their ways. Formal dress has long been accepted as de rigueur on Wall Street and its counterparts, but it’s human nature to evolve and evolution is good: this is an opportunity to embrace sartorial flair and harness personal style, to delve beyond the constraints of blazer and tie and exercise agency in livening up your day-to-day attire. As ‘business’ and ‘casual’ become increasingly interlinked, there comes new-found freedom to experiment with cuts, fabrics and silhouettes. To ease the transition, keep it simple, especially if you’re navigating uncharted territory. For ultimate versatility, invest in timeless staples that will form the basis of your work wardrobe. Well-tailored separates will be your saviours in this instance: in warmer weather, opt for lightweight linens and cottons, while in winter reach for flannels and corduroy. Experiment with combining tones and patterns - pairing neutrals with slightly darker tones is a safe starting point from which you can build up the confidence to integrate patterns like houndstooth and Prince of Wales check. Ensure a well-balanced silhouette with a fitted jacket and tapered trousers or - if you dare to edge towards the more casual end of business casual - a smart pair of jeans. Barbanera and Blackhorse Lane are two good options for versatile jeans that can be dressed up during the working week and down at the weekend. Of course, a blazer will always be a tried-and-true staple of any business outfit, but to mix things up a bit, don’t fear to substitute it for a safari jacket, a more relaxed alternative that still exudes sophistication. Anderson & Sheppard’s natural cotton version is particularly impressive. As for shirting, take this opportunity to ditch your overly-starched collared shirt for something slightly more low-key and comfortable. Denim is always a winner as far as business casual goes and there are some fantastic denim shirts on offer at the moment from the likes of Rubinacci, Marol and Naked Clothing. Otherwise, choose something collarless or with an understated print: Far Afield, Anderson & Sheppard and Salvatore Piccolo excel in these categories. When it comes to footwear, don’t go ditching your Oxfords and derbys: formal business shoes have a firm place in every man’s wardrobe and you’ll come to rely on them for important meetings and events. Simply add some more casual options into the mix: leather sneakers, brogues and loafers are all reliable bets that provide a sophisticated finishing touch to any smart ensemble. Ultimately, the key to mastering ‘business casual’ comes down to exercising your own good judgement. As the Goldman memo reads, “All of us know what is and is not appropriate for the workplace”. You will inevitably pick up cues from your environment and the people you work with, so trust in them and dress accordingly. Keep it professional but don’t be scared to inject some of your own personality as an all-too-necessary antidote to the general tedium of the corporate world. And remember: the suit is not dead.